Day two of Launch Tennessee’s 13-city statewide listening tour (here’s the schedule) to introduce the organization’s new President and Chief Executive Officer brought the group to Knoxville on Wednesday. Margaret Dolan was joined by Chief Program Officer Jill Van Beke, Partnerships Director Brittany Burgess, and Operations and Government Affairs Director Lindsey Cox for a series of meetings that culminated with an early evening reception hosted by PYA, the power behind teknovation.biz. During the sessions, Dolan emphasized that she and her team wanted to listen to the ideas that individuals had in relation to Launch Tennessee’s existing programming and future priorities. Here are several pictures from the PYA-hosted reception with individuals identified in each photo from left to right: (1) PYA President Marty Brown, Dolan, and yours truly; (2) Lynn Youngs of the Anderson Center for Entrepreneurship and Innovation at the University of Tennessee (UT), Knoxville; Geoff Robson of 3 Degrees LLC and The Lighthouse Fund; and Bob Wilson of RDI Technologies Inc.; and (3) Dolan and Eric Dobson of the Angel Capital Group. 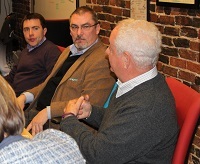 Earlier in the day, another of the meetings was a lunchtime discussion with the Innov865 Alliance Steering Committee at the Knoxville Entrepreneur Center. Here are some photos from that event, again with those in each picture identified left to right: (1) Stacey Patterson of the UT System and UT Research Foundation making a point during the roundtable discussion; (2) Dolan reacting to a question with Cortney Piper of Piper Communications to her left; (3) Dan Miller of Oak Ridge National Laboratory (ORNL) and Dennis Corley of Three Roots Capital listening to ORNL’s Tom Rogers make a point; and (4) Van Beke discussing some of Launch Tennessee’s priorities. OUTLOOK SERIES PART 6: What is the outlook for investment capital in 2017?